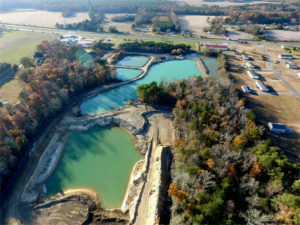 The Northampton Board of Supervisors approved a Special Use Permit (SUP) to expand the Wagner borrow pit in Eastville. The Planning Commission recommended approval of the SUP from 10 to 18 acres with the conditions that the buffer would be reduced from the current 200′ to 175′, the hours of operation would be limited to daylight hours and no Sundays, materials to be stored on site would include only include materials such as rock, brick and cement. The board approved the permit with the additional amendments that the buffer be reduced from current 200 feet to 100 feet, operating hours would be 7am-7pm, asphalt storage on the site except not in the vicinity of the ponds or standing water, as well as curtailing Sunday operations. The board also requested that organic materials not be deposited, and that the buffer be allowed to grow as dense as possible. The SUP was approved by a 3-2 vote. Supervisors Duer and Bennett voted against. This is outrageous! We can put industrial businesses on Rt. 13, but not businesses, or housing units and no real growth. How many people will this employee? What about the proximity of this pit to the homes and land owners that have lived there for years? Did it not matter that some of these folks are Seniors who had no clue what was going to happen. Yes, letters were sent, but how many fully understood? Shame on the “Powers that Be” to have let this happen! The distance from Eastville to the CBBT will be heavily trafficked during peak seasons/summer and the roads will become more hazardous. All so one industrial business could make money! Our little Shore only cares for private businesses and tourism! Well, how many YACHTS will want to travel on muddy gravel and filthy roads.